Diners at the popular Gorseinon Community Meal, Food with Friends, celebrated Christmas in style this week with a traditional Christmas dinner with all the trimmings. More than a hundred people come to St Catherine's Church in Gorseinon this week to celebrate Christmas in Style. The diners at the popular Food with Friends event enjoyed a traditional Turkey Roast with all the trimmings, followed by delicious home-made mince pies and mulled wine too. Vicar of St Catherine's Church, Dr Adrian Morgan, said: "It was a truly beautiful occasion which brought a whole community together to celebrate Christmas. It was inspiring to see people of all backgrounds - young and old, rich and poor - sitting to enjoy a Christmas meal together, laughing and getting to know each other." "Food with Friends truly is a place where barriers are broken down and friendships are built up. It is making our community stronger and better." The event, which would not be possible without the selfless dedication and support of many volunteers from across the community, also welcomed Father Christmas and a Christmas Mickey Mouse too. The children were thrilled to see Santa and Mickey and they all enjoyed receiving a free gift. The Weekly Bulletin is now available here. The first in a series of free organ recitals held at St Catherine’s Church in Gorseinon was an described as outstanding success by organisers, with more than sixty people in attendance. The Bishop has great pleasure in announcing that he has offered the post of Priest-in-Charge of the Benefice of Gorseinon to the Reverend Dr Adrian Morgan and that he has formally accepted the offer. The popular Evening Organ Recitals at St Catherine's Church, Gorseinon begin again this June. More details are available here. There was a full house at May’s Food with Friends community meal at St Catherine’s Church, Gorseinon, which included a performance by pupils from the local primary school. Organisers of the popular 'Food with Friends' free community meal were at Asda this week packing bags to raise money. The vision of the Diocese of Swansea and Brecon is to be a family, rooted in Christ, committed to transforming lives by Gathering as God’s people, Growing more like Jesus, Going Out in the power of the spirit.St Catherine's Church in Gorseinon is seeking to help make this vision a reality by offering an exciting six week course that aims to explore some of the essentials of the Christian life. Local businesses including Premier Pontlliw, Shepherds, the Market Café, Asda and Raduni donated food for a massive, free community meal held at St Catherine’s Church in Gorseinon on Thursday April 6. More than one hundred people from across Gorseinon came together today (2 March 2017) for a free Community Meal at St Catherine's Church in Gorseinon. 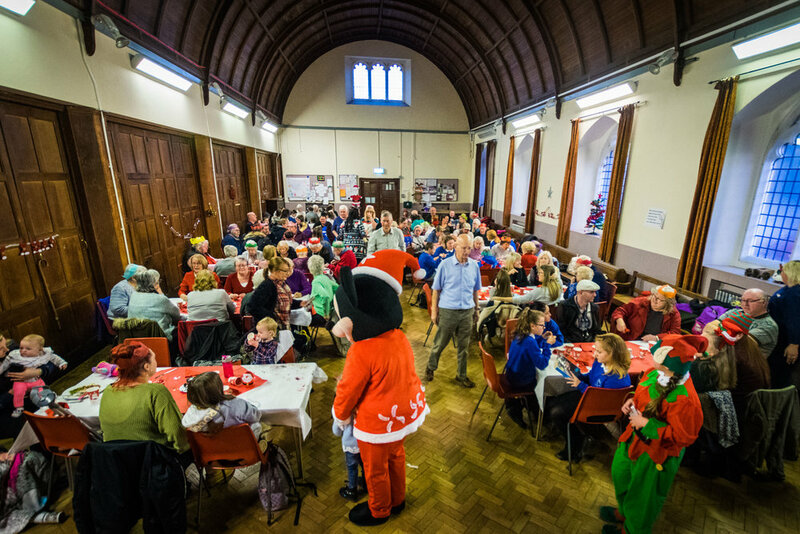 Organisers of the Meal-which include local residents, representatives from the local council and local supermarkets, as well as members from local churches across Gorseinon-have described the event as an overwhelming success. Pictured: Kathryn Lewis and Karen Evans (Gorseinon residents); Andrew Stephens (Deputy Mayor of Gorseinon), Kelly Roberts (Gorseinon Labour Candidate) and Jan Curtice (County Councillor for Penyrheol); Ronan Ruddy (Gorseinon Development Officer), Rev Dr Adrian Morgan (Curate of St Catherine's Church), Adam Benney (Community Lives Consortium) and Jaynne Davies (Asda Community Colleague). Community Leaders from across Gorseinon came together today at St Catherine's Church to begin planning a free meal for the whole community. More than 70 people came to the launch of Alpha at St Catherine's Church in Gorseinon this week. The launch of Alpha Gorseinon attracted crowds of people when the doors opened on Wednesday 18 January 2017. Organisers say that a many of those who came had little or no connection with the church. Have you had your Epiphany moment? Our Curate, the Reverend Dr Adrian Morgan, has used his New Year message published today in the Parish Magazine as an opportunity to challenge the people of Gorseinon to think carefully about the identity of Jesus. Read more here. At a special service held in St Catherine's Church in Gorseinon on Sunday 20 November 2016, the people of Gorseinon said a fond farewell to their Vicar for over six years, Reverend Martin Cox. Hundreds of people turned out to enjoy a Festival of Winter Music held at St Catherine's Church this weekend. We wish our Vicar, Martin Cox, and his wife, Barbara, well as they prepare to begin a new ministry in the Diocese of St Davids. A film screening at St Catherine’s Church in Gorseinon had a happy ending, after more than 100 people took their seats to see silent classic The Hunchback of Notre Dame. Martin Bell our church organist has just released his first ever CD recorded on our magnificent Nicholson pipe organ. The CD, which includes 8 tracks of well known pieces of music which will give hours of pleasurable listening. The October breakfast was a huge success, with more than ninety members of the community - people of all ages, many of whom had never been to church before - joining us for a free breakfast. We are currently updating our Electoral Roll. If you haven't yet returned the necessary paperwork for your details to be entered onto the new Roll, then everything that you need to know is available here.